This book presents a clear and in-depth account of abnormal psychology. It focuses on both clinical descriptions, using illustrative case studies at the beginning of each section, and on the implications of the major theoretical perspectives and relevant empirical evidence for clinical treatment. It provides a very readable and up-to-date review of topics including childhood behaviour disorders, anxiety, depression, schizophrenia, personality disorders and models of abnormal behaviour. 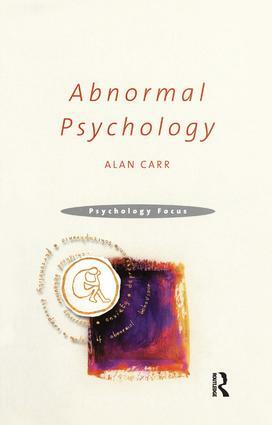 Alan Carr illustrates a scientific approach to the understanding of these aspects of abnormal psychology. Both the content and style of this book will help students understand a complex area of psychology. Childhood Behaviour Disorders. Anxiety Disorders. Depression. Schizophrenia. Personality Disorders. Models of Abnormal Behavior.